To Emi & Eve founder Cassandra Postema, fashion is about adorning oneself with what resonates with what is on the inside. Each item should have a story and meaning behind its composition, be made from materials that create a conversation, and be produced through a process that makes a positive change in someone’s life. Through her “From Bullets to Beauty” collection, she transforms metal taken from Cambodian bomb casings and bullets to create accessories that represent friendship and peace. The jewelry and handbags are made by artisans in Cambodia and China in an effort to economically empower their residents and continue the tradition of craftsmanship. After graduating from Central St Martins’ School of Art with a degree in fashion and printed textiles, Postema began to work with vintage and upcycled fabrics that she collected from sites across the globe. Soon, she found herself entering her creations in upscale London boutiques to much acclaim and earning the British Council’s New Generation sponsorship award. The award allowed her participate London’s Fashion Week, and while she enjoyed her experience, she realized that she did not fit into the established industry framework. She longed to return to Asia where she was raised and find her voice as a designer. “I think it’s important as a designer, being at the start of the production process, to incorporate sustainability practices in our work . Apart from the eco/green/ethical/sustainability angle, we are about the story of positive transformation.” she says. Now, partnering with local artisans and organizations such as Craftworks Cambodia, Postema is looking to crowdfund her line of handbags and jewelry through an Indiegogo campaign. By using recycled materials that were once mean to harm, she hopes to transform the message of violence into one of peace. In addition to providing a livelihood to residents of impoverished communities, she strives to promote the efforts of people who still use traditional methods of production. To support Emi & Eve, visit their Indiegogo site. 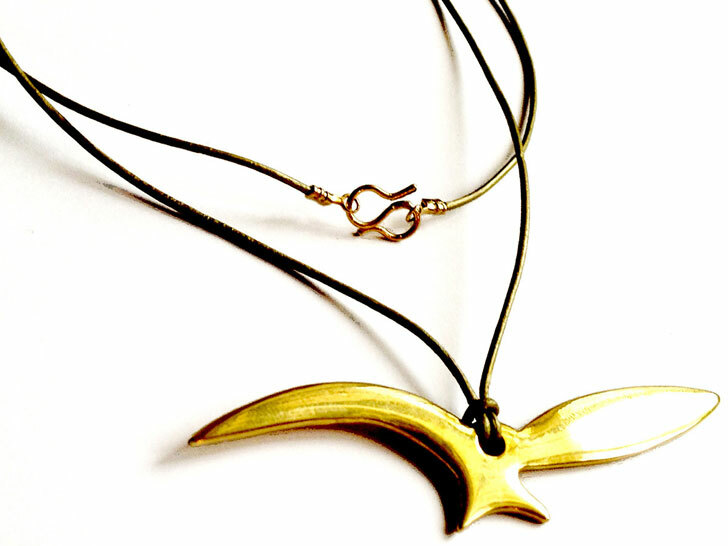 For a minimum contribution of $35, donors can receive the soaring bird pendant symbolizing freedom from anger and perseverance. To Emi & Eve founder Cassandra Postema, fashion is about adorning oneself with what resonates with what is on the inside. Each item should have a story and meaning behind its composition, be made from materials that create a conversation, and be produced through a process that makes a positive change in someone's life. Through her "From Bullets to Beauty" collection, she transforms metal taken from Cambodian bomb casings and bullets to create accessories that represent friendship and peace. The jewelry and handbags are made by artisans in Cambodia and China in an effort to economically empower their residents and continue the tradition of craftsmanship.